Airtel's Rs 999 data plan counters Reliance Jio's Rs 999 plan. Bharti Airtel offers 50GB data while Jio offers 90GB data. Airtel is now offering 50GB 4G/3G data with its Rs 999 postpaid mobile subscribers. The new plan counters Reliance Jio's Rs 999 plan that offers 90GB 4G data to its Prime subscribers. With Rs 999 Infinity Plan, Bharti Airtel offers unlimited local and STD calls with unlimited roaming on both incoming and outgoing calls. The largest telecom operator in the country also offers data rollover option, where users can carry forward the unused data from their existing plan to next month. The plan is available to both existing and new subscribers. 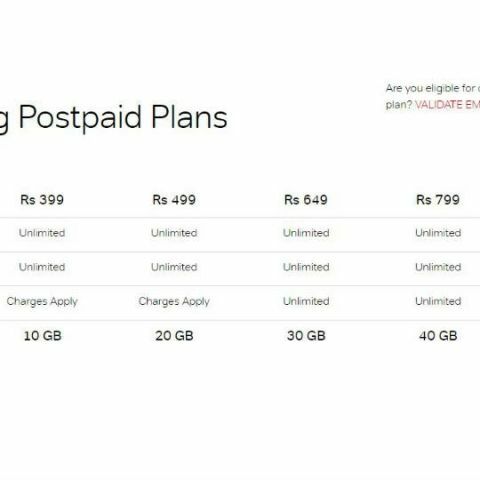 Airtel also offers a Rs 999 prepaid tariff plan with daily data benefit of 4GB on 3G or 4G network. Under its prepaid plan, the company is also offering 50 percent cash back with Airtel Payments Bank. In comparison, Reliance Jio offers unlimited voice calls, unlimited SMS and 90GB free data with recharge of Rs 999. Jio recently increased the validity of this plan from 60 days to 90 days. Since the launch of Jio's 4G service last year, the telecom operators in the country are engaged in a bitter tariff battle. Airtel has been in the forefront when it comes to counter Jio's plans offering free voice and data benefits. Despite Jio's growth to 130 million subscribers, Bharti Airtel has not seen any consolidation in its own user base. The company announced its partnership with Karbonn to launch a smartphone that will compete with the JioPhone. The Karbonn A40 Indian is priced at Rs 1,399 and Airtel is expected to announce more such products to further its presence in the segment. the best option to store data is ?